Camp. & Carav. Las Lomas is a campsite with 100 touring pitches. During low season, between 01-01-2019 - 17-04-2019, 21-04-2019 - 01-07-2019, 01-09-2019 - 06-12-2019 and 08-12-2019 - 27-12-2019, the nightly rate is €20,- at one of the 100 touring pitches at Camp. & Carav. Las Lomas in Güéjar-Sierra (Granada). Campsite with lots of facilities and spacious, marked-out pitches in the shade. Altitude: 1100m, about 200 m above storage reservoir. Beautiful view of the mountains of the Sierra Nevada. Only 30 km away from a skiing area. Everything else was great, pitch, location, hiking, even our food in the restaurant was superb. Having lived in Granada for the past 15 years but new to motor-homing, we still feel aggrieved when obviously being overcharged as foreigners! This is a fabulous site, with views of the Sierra Nevada and close to the lovely village of Guejar Sierra. Fantastic walking, and you can drive to the top of the Sierra Nevada. Great bus service down to Granada to visit the Alhambra. The site itself was surprisingly empty but filled up at the weekend. Very few long term stayers, good pitches with plenty of water points. Very helpful staff and a good campsite restaurant. We certainly aim to go back. We arrived at the reception where the staff were very friendly and helpful. We were allowed to inspect the site and choose our pitch which we thought was a bonus. Drinking water was available at numerous points around the site and most pitches had a sink with running cold water. Very handy! Toilets and showers were kept very clean and there was always hot water. Pool area was tidy and the pool large but not heated. The surroundings were beautiful and the views from the bar terrace stunning. A bus runs from the entrance regularly that takes you to Granada in one direction (40 mins) and to the nearest town in the other (10 mins). This area is stunning with some great restaurants nearby by car, although it was hard to find better food than that served at the site restaurant. Excellent quality meat and friendly helpful staff, we are not regular campers so we cannot compare this to other sites but our experience was excellent and we would definitely return. Toilet facilities good, kept very clean. 20mins.drive to Alhambra but must book on line before you go. Large screened pitches, we preferred top of site. Swimming pool very good with plenty of grass shaded sitting areas. Shop ok for basics but plenty of choice in Granada. Well worth 30kms drive to Sierra Nevada ski resort. 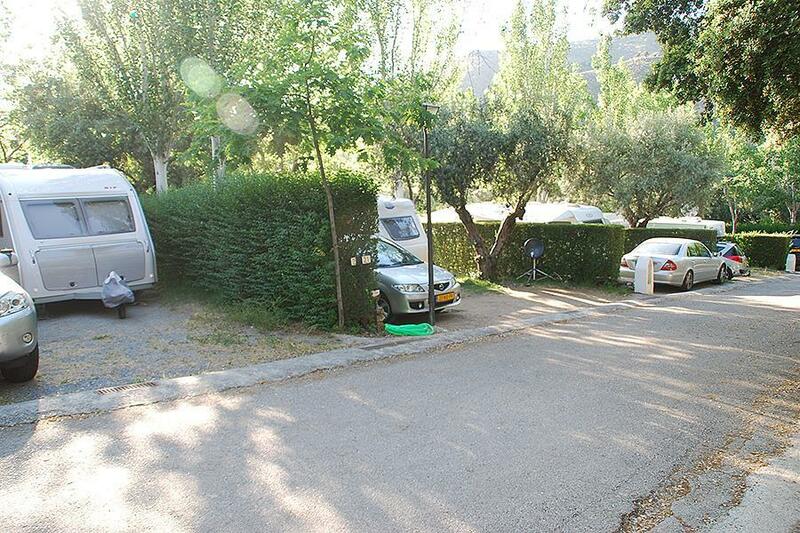 Great location with fabulous views both to Granada and Sierra Nevada. Staff welcoming and very helpful. They have lots of information about Granada and the surrounding area. Good restaurant on site open daily throughout the year. Great bus service into Granada and the local town is within walking/cycling distance. Site is kept clean as are the toilet/shower blocks, though the showers could do with being retiled. Twisty, hilly road from Granada to site which might cause problems for caravans. We enjoyed our few days there. The views from this campsite are breath-taking, and the staff very helpful. Our pitch was spacious and they are all separated by hedges, with a variety of sizes and shading available. The only thing that lets the site down is the musty smell in the showers, where there is a problem with dampness and condensation. Don't let it put you off though, as the site has a lovely feel about It and is a good location for visiting Granada, the Alhambra and the Sierra Nevada. There are also lovely walks nearby with rivers, waterfalls, mountains and at this time of year, lots of beautiful almond trees in blossom. We will come again. A good base for skiing and cycling if you like hills. The scenary is lovely. Good bus trip to Granada. Heated shower block. We were a little shocked when shortly after leaving the main road outside Granada when our GPS navigator announced it did not know if the road was suitable for caravans our size. We continued and although quite steep in places with a couple of hairpin bends it was a wide well made road that gave us no problems. The pitches on the site are a variety of sizes and the friendly and helpful staff pointed out the ones that would most easily accommodate our 8m twin axle caravan. The facilities were kept spotless with all the necessities provided. We were in Granada to visit the Alhambra. As we hadn't known quite when we would be there, we hadn't booked a campsite or the ticket for the Alhambra. We rang the campsite when we were about 70 kms away and were told there was plenty of space no need to book. We were very happy with the pitch and the facilities are excellent. The site is in the Sierra Nevada, a twisty 10 kms from Granada. The staff advised us that we could get tickets for the Alhambra on the day we wanted to visit if we were prepared to go very early and queue for a limited number of day tickets. That worked well and we were even more pleased with our choice of site when we drove back from the heat of Granada up into the cool fresh mountain air of Guejar Sierra. It is a lovely site and we had amazing views of the mountains from our pitch. The restaurant meals were good and the shop sold a useful array of food as well. We stayed for another few days and enjoyed the peace and beauty . Highly recommended. CampingCard ACSI will send your information request to "Camp. & Carav. Las Lomas".